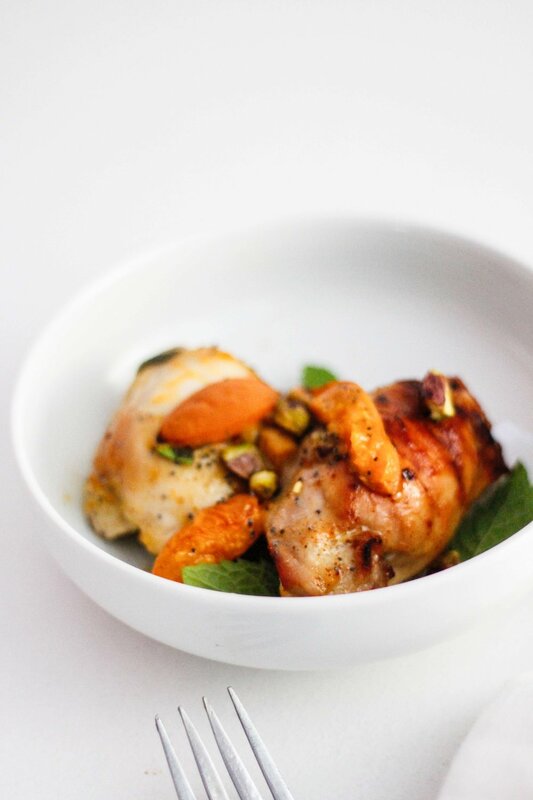 Roasted apricot chicken is a sweet take on your old favorite, roasted chicken. Garnished with chopped pistachios, poppy seeds and fresh mint, this is an easy but different take on the classic dinner dish. Oh, and don't forget those jammy roasted apricots! They make the dish. I just got back from an amazing week in the Hamptons, and I would be lying if I didn't say I miss it a teeny bit. I mean, the beach! The farm stands! The wine! It's honestly an expensive dream of a place. But let's go back to the farm stands for a second. They're insane, truly, but I was in heaven with all of the beautiful stone fruit. But alas, it's almost the end of summer. I'm bringing you into the pre-fall season with a little mix of summer and fall. The method is roasting which is perfect for fall weather, but we're hanging onto summer with a stone-fruity chicken recipe. It's easy, and a great way to introduce yourself to a fun technique. Searing to get that crisp outer crust and then baking to roast it up. The recipe is below for those that want some adventure! Prepare the marinade by combining the apricot jam, mustard, lemon juice, and a sprinkle of salt and a liberal drizzle of olive oil in a bowl. Add the chicken, tossing to coat. Let the marinade sit with the chicken for at least 30 minutes. Pre-heat your oven to 350 degrees Fahrenheit, conviction setting preferably if you have one! Heat an oven-proof pan on medium-high heat. Add the chicken, leaving behind excess marinade. Sear the chicken on one side until golden. Flip and then sear it again on the other side. Once golden on both sides add the sliced apricots and place the pan in the oven. Bake the chicken for another 30 minutes or until cooked through in the oven. Remove the chicken from the oven. To serve, top each serving with chopped pistachios, a sprinkle of poppy seeds and plenty of fresh mint. Oh! And don’t forget to spoon the baked apricots over the chicken.